If I haven’t already made that abundantly clear, I’m a sucker for odd and unusual tools, especially when they are completely useful to me in my shop. 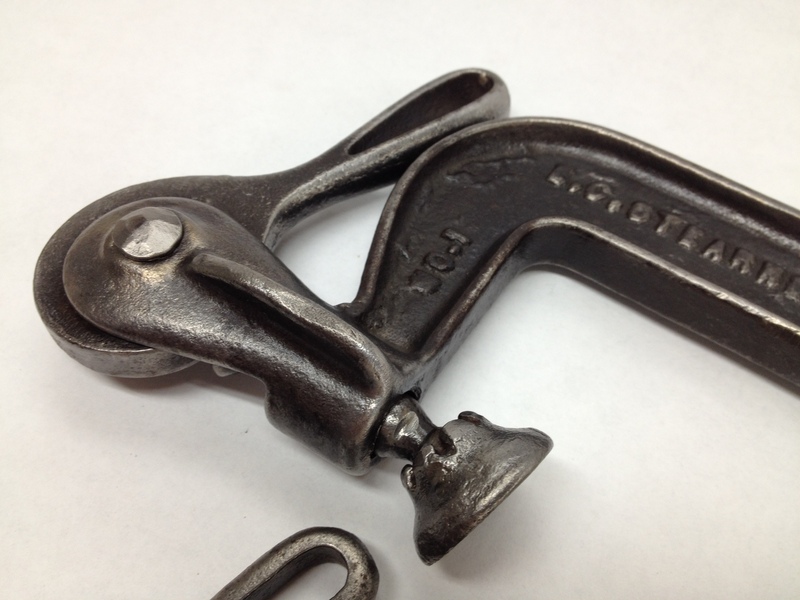 When I have smaller clamping tasks, I like to use old C-clamps – the kind with acme threads and cool details, like a shapely or interesting knob on the threaded post. I usually find them at estate sales for just $1 or $2; I never pay more than $5 for one. I have about four or five that see constant use in my shop. What ho! What are YOU, my little metal friend, and where have you been all of my woodworking life? Only home for a few days and he already has a rusty older brother! Er… I happened to find another one that listed the same day I received the first one. Fortuitous, no? It had a BIN that was reasonable and there were already several watchers after just a few hours, so I didn’t let it sit there for long. 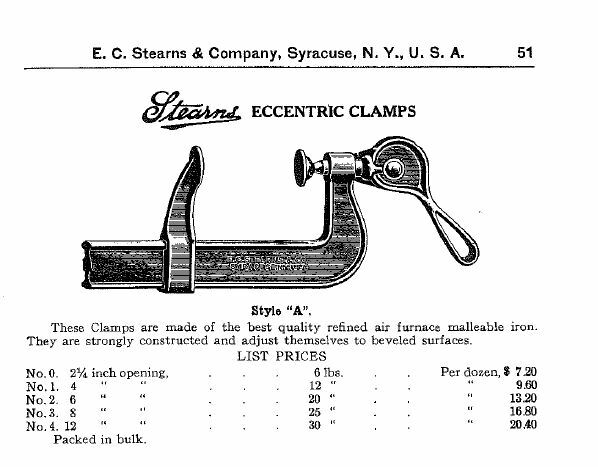 It’s also an eccentric, “A” style clamp by E. C. Stearns. This is the No. 1, with a 4″ opening. It was a bit rustier than the first one; in fact, it didn’t really work very well because of the rust on the cam and post. I had a pretty good idea of how I would clean it up, but I wanted to check with the seller of the No. 0 to see if that was what he did, as well. It was! So last night I spent a bit of time in the garage at the slow speed grinder, using a brass wire wheel to clean up the clamp. I will probably always keep that tool in the garage, or at least outside of the shop proper, because I don’t like the idea of having bits of ground metal in the woodworking shop. After a bit of touching up with a smaller brass wheel on the Dremel, I refreshed my microfiber shop woobie with a few spritzes of camellia oil and wiped down both clamps. These things are a joy to use! The sliding jaw on both clamps moves very easily (I won’t voluntarily admit to sometimes struggling with getting the jaws adjusted on my F-style and parallel bar clamps). There wasn’t any way to photograph it, but a spiral spring located between the jaw and the bar holds the jaw in place once you position it. Clamping pressure by the eccentric plunger causes a slight racking of the jaw, which locks it into place. Both clamps are able to exert plenty of pressure for any of the tasks I would give them, like pressing a small inlay into place or adding a stop block to my miter box fence or any of the other numerous tasks I normally use C-clamps for in the shop. You and I are both really lucky I don’t have any kind of “Schwarz” effect on the price of tools when I talk about them. Otherwise, my blog would be really boring, as I wouldn’t write about any of these great tools until I’m certain I don’t need to buy any more! As it stands, I’m not really afraid of writing about them while the initial excitement is still high. For the next post, I’ll try to get back on-track with my beading tool collection. Stay tuned. 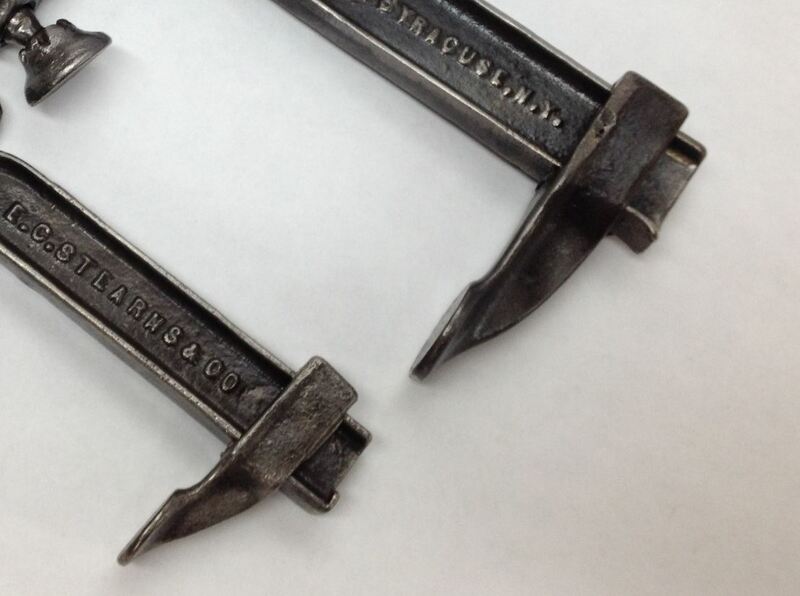 I wrote a blog about these clamps a couple of years ago. I have since bought four more made from various makers. They are a joy to use. It’s a shame they are no longer made. Hmmm… Can you link to it? I tried searching you blog but couldn’t find it. Would love to read your thoughts on them. 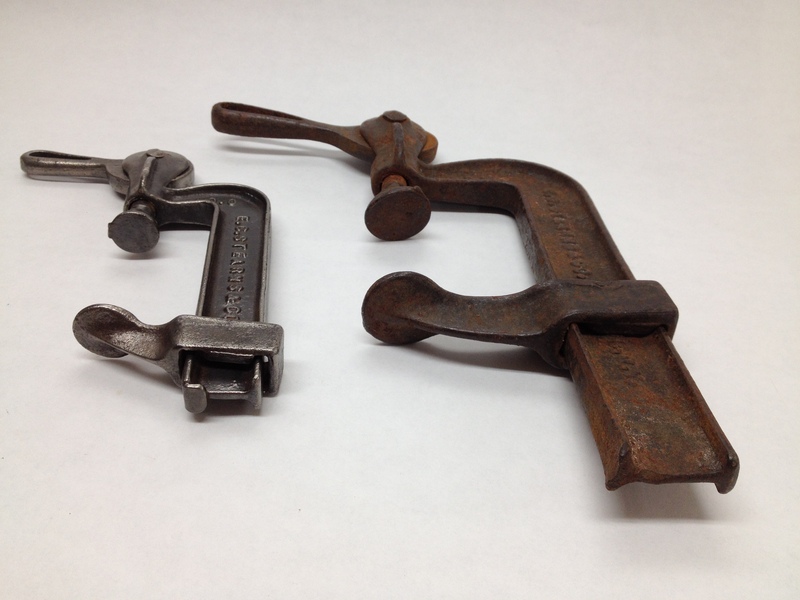 Mine are early James L Taylor clamps from Poughkeepsie, NY. 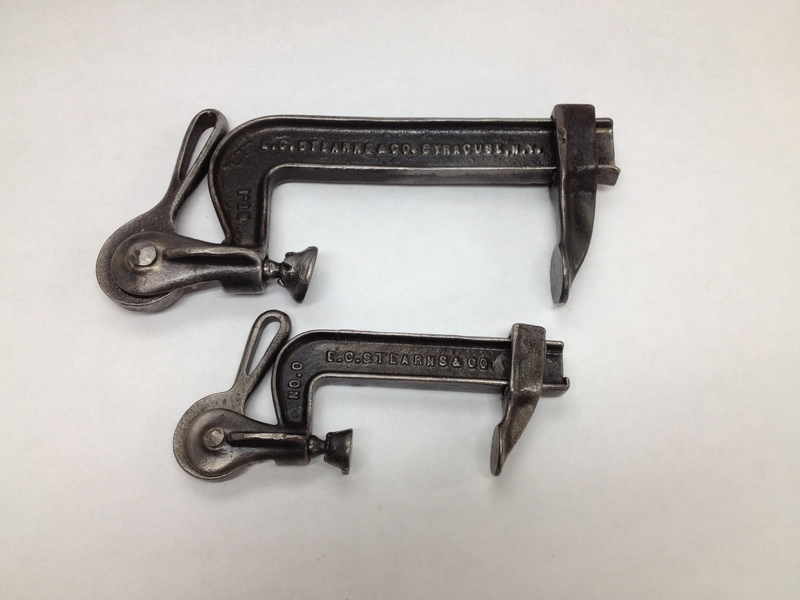 I’ve since bought a smaller version of them with large pads like Bessie cabinetmaker clamps that’s called a gun stock clamp. I use like a quick action holdfast. I intended to write a blog about it, but have yet to do so. The thing is pretty slick. Very cool! 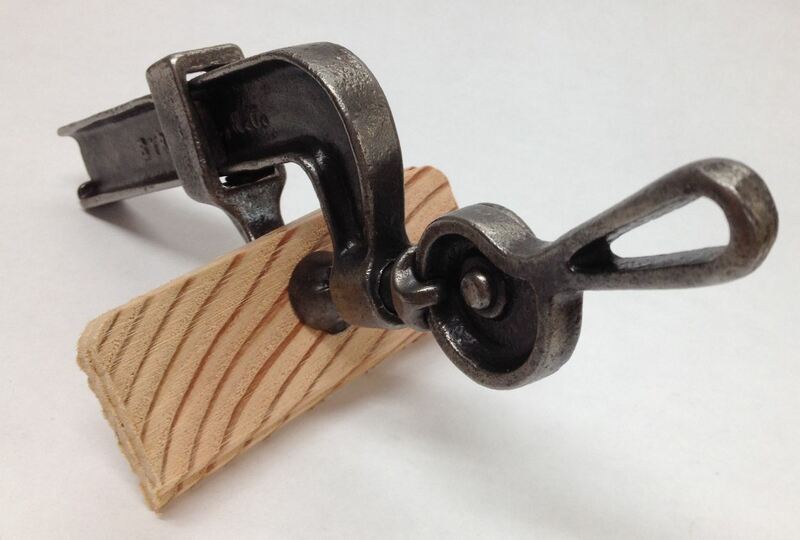 And I agree – someone needs to be making clamps like this again. Only problem is, if Bessey charges $55 for one of their 40″ parallel clamps, what do you think they’d want to charge for a malleable iron clamp? Well… once they get bigger, just the jaws and head are malleable iron. The bar is steel. 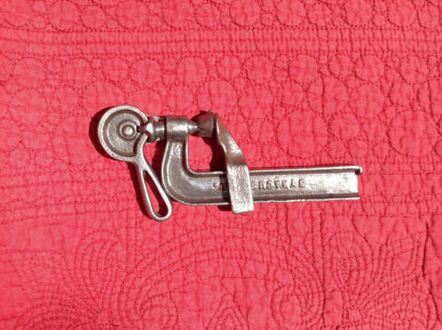 But still… either the clamp makers are gouging customers or making a cam-action clamp in today’s market would result in some expensive clamps. Still, something to look into. Thanks for the link!